ALBUQUERQUE, N.M. — A 1940s pinup leans from a stool into a body of water, her rubber-gloved hands churning the waves as the sun blazes. Culled from a triad of photo realism, Surrealism and Pop Art, the painting is a collage of photography and oil, of fantasy and portrait wrapped in a ménage of mystery. Jennifer Nehrbass [BS-Art ’93] is both the model and the artist. 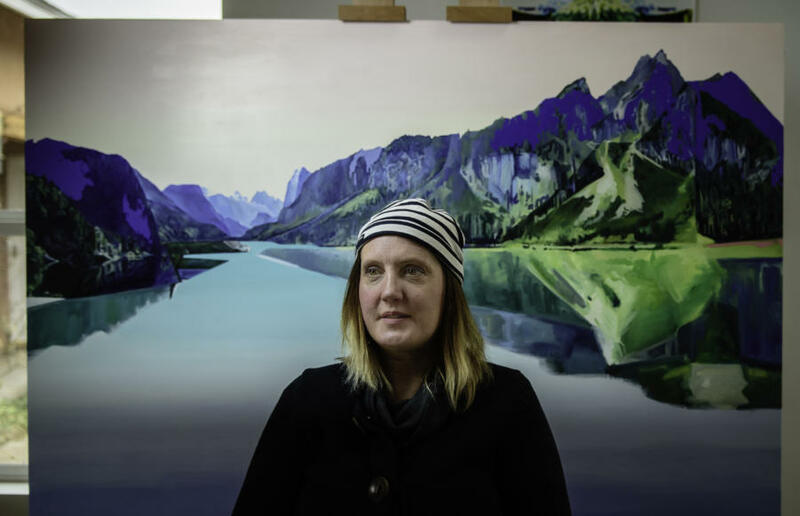 With gallery representation in Denver; Park City, Utah; Linz, Austria; and at Albuquerque’s Central Features, she moved from 10 years of design at Ralph Lauren to the near North Valley in the Los Griegos neighborhood. It’s been a personal journey from small-town Wisconsin to the top of the fashion food chain to a converted New Mexico carport-turned-studio. A roadrunner named “Joan” clicks outside the window.